Chloe has already gone back to school in Missouri. Her last day in Phoenix was a hectic one, as she hadn't really packed at all, but I'd made her an appointment at the Walgreens on the corner to get her vaccine for our trip to Morocco. She wasn't sure yet about coming home on Spring Break so I wanted her ready to go when she arrived home before our trip in May. Phoebe and Naomi are also back in school of course. 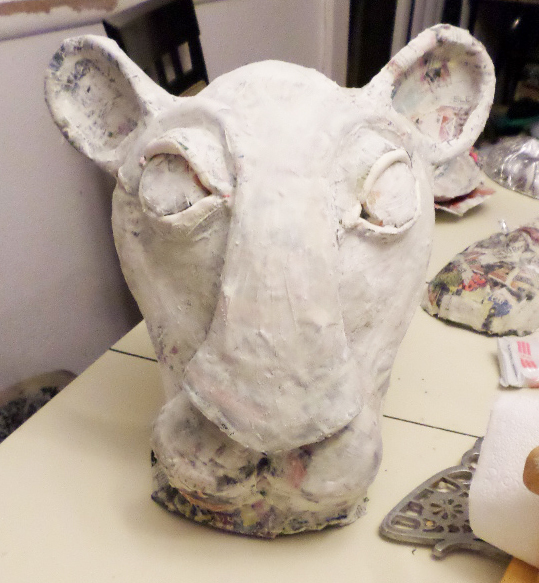 Though it's a slow start with the holiday weekend last week and I've been busy with many mask commissions. 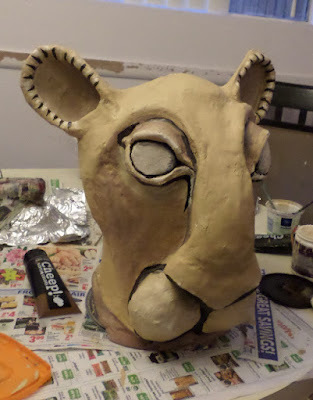 This is an in progress photo of a head dress I made for Nala for a production of "The Lion King"
Here it is finished. I sculpted it attached to a baseball hat, but still had to add a strap. They may want me to work on more head dresses, but I'm still waiting to hear. This is a cow skull mask I'm still working on for a film in California. 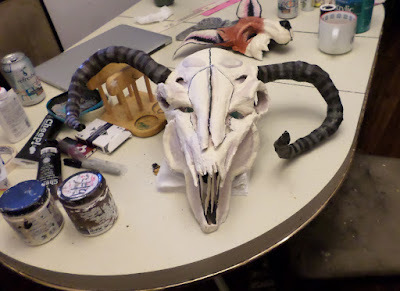 It's mostly finished, but the director wants some changes on the horns. I've also been filling tons of other orders and illustrating a children's book called "Hockey Toes" (I'll share some images soon.). Next week I go back to my teaching schedule as well. The weather here is gorgeous however and we've managed to take some great hikes with the dog around the city. This is one of the best times of the year in Phoenix, so I hate to spend it all at my desk! Anyway, Happy Wednesday!